did you mean the one i posted junkyard steels ? Just remember, nobody guarantees that chart bears any relation to reality. For instance, I have a pile of 1045 jackhammer bits, some 5160 and 4140 used by the local Snap-on tool factory to make wrenches, some axels of 1050H, and a few other things most definitively not the steels that this list suggests they should be. Nicholson files are made of 1095, not W2, per information given to Dr. Batson by the factory. 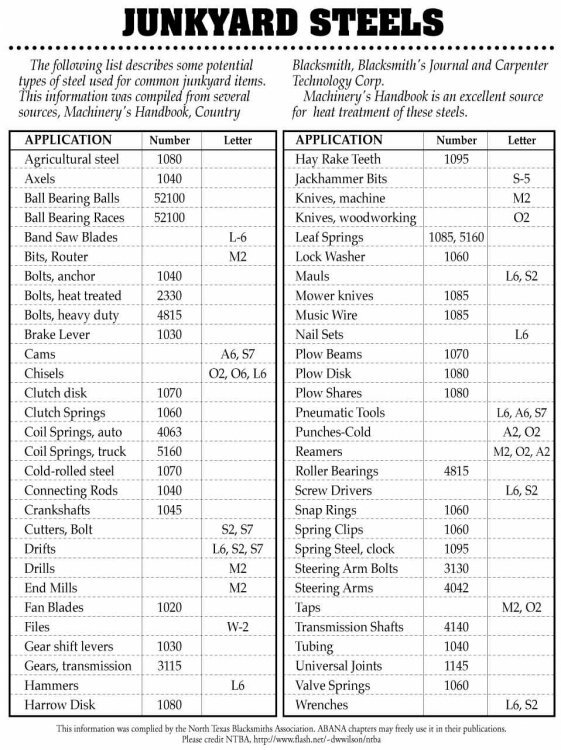 That chart is just a list of guesswork and suggested steels for the application involved, often from outdated sources. I'm not saying you can't use it as a very rough guide, I'm just saying don't be surprised if it isn't accurate. err.. just saying.. oh.. and they said it is not W2 forsure !! You get first prize for "understatement of the day", my friend. Once upon a time, some manufacturers used xxxx steel to make this part. In today's global marketplace, the resource pool is all cross contaminated with re-melted appliances and automobiles that still had electric motors, chrome bumpers, 12 different alloys, and the aluminum trim still on.... All bets are off unless you get the information from the source of the scrap, i.e. the company that bought the steel in the first place, and has the chemistry from the mill. Better yet, buy some known steel, it amounts to very little in the cost of making a knife. And can save innumerable hours of frustration and strife for all concerned with it. Especially when it comes to heat treatment. If you have nothing but time or are doing this for your own amusement, by all means do the junkyard steel thing. I did it when I was starting out and my time was worth less. I soon decided that it was better to know, and only have to do it once because it is predictable when all your steel is the same kind. I use salvage materials myself, but not for customer's blades. Only for shop built tooling and machinery, and the occasional odd farm implement repair job. No hard feelings, Tell! Heck, I use fresh leaf spring stock myself. Luckily it's marked 9260. Just trying to keep the new guys from too much frustration. It's hard enough learning this stuff without having to learn how to assay your own junkyard steel at the same time. Hey Alan where do get 9260 leaf spring at. If it is cheaper than the stuff I bought I would be greatly appreciative if you could let me in on your supply of it. I haven't totally made up my mind, but I am almost sure that 9260 is gonna be the metal of choice for me. I need to actually heat it up and hit with the hammer first. I plan to try 9260, 1070, 1084, and maybe 5160. I will then decide which I like better. Oh and it is unfortunate that you wont be making it to Batson's this year. I haven't totally made up my mind, but I am almost sure that 9260 is gonna be the metal of choice for me. I need to actually heat it up and hit with the hammer first. I plan to try 9260, 1070, 1804, and maybe 5260. I will then decide which I like better. I have no idea what their reasons are, but there are bladesmiths that have no problem using 5160, but refuse to use 9260. As I understand it, 9260 is the same thing as 5160, but with 2% silicone added for flexibility. I've never had any problems when I forged 9260, but I haven't been bladesmithing as long as most on this forum, so there may be a decent reason to prefer 5160 to 9260. If you haven't already, I'd consider asking experienced makers their opinion on any differences before committing 9260 to be your primary metal of choice. Will, to be honest it was given to me by a friend who picked it up at a local spring shop. They didn't know what it was ("Whaddaya mean what kinda steel is it? It's spring steel!" ), but luckily it's marked "made in Canada 9260 2.25 3/8". Leave it to the Canadians to be nice enough to actually label their steel for the end user. It is exactly as Matthew said, same as 5160 except with silicon instead of chromium. In my opinion, they are interchangeable, but the 9260 may be slightly tougher. It's slightly easier to forge than 5160, and it shows a hardening line a little better. I haven't tried welding it yet. Note that "slightly easier to forge" is a relative thing. 1070 is a little easier to forge than 1084, in terms of amount of hammering required. It's a small enough difference I don't think you'd really notice, though. When you get to Batson's, go down by the little creek in the pines, about halfway along the right-hand road behind the concession stand. There will be a couple of guys there teaching "green coal" classes, basically taking the totally inexperienced and helping them forge their first blades. It's usually Wes Byrd and Larry Harley, but I don't think Harley's going this year either. They are both excellent instructors. Hang around until you get to forge something. You'll be hooked! Admiral Steel has 9260 in two sizes. Click on the 5160 on their online knife steel page to find it. Alan, I think it is nice that they mark their steel also. I am gonna have to get even more determined to find a spring shop around here somewhere. That is IF there is one. From what I have read from others 9260 doesn't want to weld to itself very well. But I am guessing it will weld just fine to others. Thank you for the tip, I do have 2 Sea Robin anvils and a couple of hammers that I bought from Chuck. I am going to try and find a cheaper vise while down there. I really hope Aldo is there this year, I sent him an email a while back for pricing on his 1084 and haven't heard from him yet. What is 1095fg? I haven't heard of that one yet. I imagine that it is a special mix made just for Aldo. Thank you for the info, but I already have some 9260 that I bought from them. I have the order page for the 5160 saved to my favorites. I was just looking for possible alternate (cheaper) sources. I would also like to add that maybe, and I am no expert here. But maybe the extra toughness of the 9260 is better suited for longer blades and the 5160 for shorter ones. That would be my guess about why knife makers would just use the 5160. Maybe you can get it a little harder than the 9260. I was told that coil springs from a truck, like a 1987 Chevy truck was 5160...is that right ? Most likely not. GM started using 9260 for coils springs in the 1970s, now they don't say what it is. All you can really say about it is if it's an automotive coil spring, it's reasonable to assume it will work in a similar manner to 5160. In other words, you're mostly safe treating it like 5160, you just can't say for sure that it IS 5160. I have heard rumors that some manufacturers are now using some kind of weird powder metallurgy alloy for springs, so all bets are off with new material. Yet another reason to buy known steel, eh? Through sometime in 1979, the mill I worked for, Crucible Steel's Midland, PA plant was selling 5160 to the auto industry (I believe all 3) for auto Coil springs. It may have continued after that, but I don't know as I left Crucible for other employment. In the 1981 & 1982 I wroked for J & L Steel Research - one of the projects was to replace quenched and tempered auto coil spring with micro-alloyed HSLA steels, where they gained the needed properties from controlled cooling after forming. I saw an announcement in the ASM Metals Progress sometime after I came to work for North American Hoganas in Jan. 2001 of the commercial announcement and roll-out of the micro-alloyed HSLA steels for coil springs that I'd been working on 20+ years ago. So, no guarantee on modern coil springs being an alloy suitable for knife making.